Yo, Lucille Mazzarella here. I grew up in Jersey—New Providence—as a matter of fact, I still live there only a couple of blocks from where my parents had a house. The place has become all la-di-da in recent years—it wasn’t like that when I was growing up. There’s a pretty big crowd of Italian-Americans who all went to Mass on Sunday (this Saturday night stuff was unheard of back then and Mass with guitars? Forget about it) and the women wore hats or those lace doily type things on their heads. Sunday was dinner at your grandmother’s house—soup, pasta, meat, salad, fruit and nuts and finally cannolis that we got from this bakery in Maplewood. My grandparents used to go to this place—I was too young to remember exactly where it was, but it wasn’t far—where my grandfather would pick out a live chicken and later the next day it would appear on my grandmother’s table for Sunday dinner. My grandfather made his own wine, and they grew so much basil in their garden the whole place smelled of it all summer long. Now it’s my turn to host the Sunday dinners. Only life isn’t the same no more. What with girls having baby daddies and no one caring if they’re in the family way and not married…I don’t know what the world is coming to. And now my brother-in-law is dead…murdered! And the police are trying to say my Frankie did it. Richie Sambucco is the detective on the case. Richie and I go way back—back to the time in high school when Frankie and I broke up for two months. It seems Richie hasn’t forgotten. And frankly, neither have I.
I sure have my hands full trying to prove that Frankie didn’t murder his brother-in-law and none of my family did either. Every time we sit down to Sunday dinner we wonder if one of us is a murderer. Follow Peg on Facebook or chat with her on Twitter @pegcochran. Visit her website for more info. 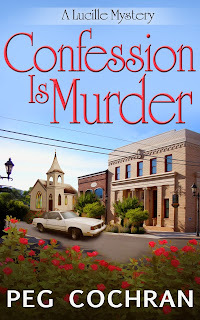 Confession Is Murder is published by Beyond the Page Publishing and is available at Amazon, Barnes & Noble, Smashwords and other ebook retailers and was a "Nook First Book" --compelling stories from emerging authors. I love chicken and dumplings good comfort food. Also, you could fix baked chicken, meatloaf, chicken with homemade noodles, or lasagna. This certainly reminds me of the way I grew up. This should be a fun read. This sounds like a really fun story with a great main character! I love it... I lived in a solidly Italian neighborhood the first 10 years of my life. Back when the world watched every move the children made, and you received "swift justice" if you got caught. Parents didn't hold with double jeopardy back then either. You got punished again when you got home. Those neighborhood drums passed along your transgressions faster then the speed of light. I love this authors work and own both of her other books. I'm looking forward to reading this one also. A new to me series and another author to put on my must read list. Life was different many years ago even if you werent Italian and grew up in the city. Fun main character! Congrats on the story/series. HI SandyG, where do you live? I grew up in New Providence, spent 20 years in Summit and then moved to Grand Rapids! Pasta and tomato sauce are in the ethnic foods aisle here! (Grand Rapids is heavily Dutch with some Polish thrown in.) I'm working on the sequel to the series now...Lucille and her best friend Flo get up to some great tricks! Hi Peg, I grew up in North Plainfield, moved to Bound Brook for about 12 years and then back to North Plainfield. Sandy, we weren't so far away from each other!